I ‘ve been a Civil Marriage Celebrant for 40 years. This is about writing your own vows for your marriage. ceremony. This is possible now since the Australian Attorney General Lionel Murphy founded Civil Celebrants in 1973 – to bring dignity into the lives of non-church people through ceremonies of meaning and substance. In those days the only alternative to a church ceremony was a very anemic and humiliating “so-called” ceremony in a registry office. So Murphy, in a revolutionary way, established the right of people to create their own marriage ceremony, which included the composition of that most important part of that ceremony – the vows. Instead of vows coming from somewhere else – God, the Church, the Government, — Murphy’s dream was that they would come from the experienced heart – from you. The best approach I can suggest to you is a way to carefully make a compact. That is, after all, what marriage is – compact. (Don’t like the word – contract). My conviction on this insight came from a woman commentator on the BBC. She criticised the vows in the Church of England wedding ceremony because it was not a compact. The ceremony should be the roadmap for the marriage.Often it was not a sincere agreement. It is important that you give this compact — the words mean “a coming together to make peace”– expressed in your vows to each other – very serious thought. Now what a well trained celebrant (or relationship educator in some cases) – will suggest to you, and help you put into good words, is this compact. First, for an hour or so, each of you should go your separate ways! You should sit down in a corner somewhere with a writing pad or clipboard, or at a desk ,or at the keyboard, and think carefully – then compile a shopping list of what you want the other person to promise you – your wish list of promises. Promise to give you space. to maintain a sense of humour. Bettina Arndt interviewed 100 couples. 80 % were not happy because one party or the other denied the partner physical intimacy. This is such a distressing finding. So you may wish to promise the other to do you best – that is what all vows are anyway – it is about attitude really – emotional, spiritual, and physical intimacy. Then you must come together and – forgive the word – marry your lists! Sometimes this a tad confronting. If you cannot achieve this then you really should think twice about getting married. The compact is a road map to a happy life. No agreed roadmap should contain unresolved conflicts. Seek reputable marriage preparation counselling. and claiming me as your closest friend. and speak to you respectfully, at all times. or stonewall you in difficult moments. rather than let any resentment fester. when you need me as your listening friend. and I ask the same of you. we have experienced in our relationship. emotional, spiritual, and physical intimacy. to witness, that I take you Mary, to be my lawful wife. © D.Messenger – permission given to brides and grooms to use, adapt in whole or in part in a marriage ceremony, without acknowledgment. This extract is part of the International College of Celebrancy Wedding Diploma. No permission is given to republish without my permission on the internet or in any publication and certainly not without acknowledgement. Permission will be readily given for bona fide use (I have given several celebrants permission to send/give to clients . This entry was posted in Uncategorized and tagged Celebrancy course, celebrant training, civil celebrants, Compact, Dally Messenger III, Lionel Murphy, marriage, Wedding vows by Dally Messenger. Bookmark the permalink. Good one Dally, this really gets to the heart of the matter and would require couples to think deeply about what they wish to ask from and offer to each other. I like that you’ve put the legal vow last, a very good idea as it’s what I like to do with my couples. Dally, once again you have shown a great example of how to craft and create the most meaningful words that any two people will make during their lifetime. Thank you for your endless generosity in sharing about making a compact. Nice to hear from you Sue and thanks for the encouragement! I am complimented Louise. Full permission to reproduce any way you want. Many thanks, Dally. This will be a great template to give to couples, some of whom struggle with the vows. The notion of compact is based on truth, honesty, integrity and mutuality and I think people will appreciate having a guide like this. Also I love the legal sentence coming last. Thanks John! Happy Xmas to you and yours. So true Dally the ceremony is the binding of the relationship. For some it is the beginning of a journey while for others it is marrying the lists of agreements. Would be good to turn the negative components into positive components e.g. not to let anything fester – speak about any problems as they occur. “Agreement” is my preferred descriptive word. It implies the legality of a contract but also adds the humanness of a melding of the minds, emotions and attitudes. However, whatever it is called, your suggestions above, Dally, are quite useful for all concerned! Thanks Charles – a Happy Xmas to you and yours. Nice one Dally. A compact is delivered with more than a shrug of the shoulder – while the words may not be heard at the time, the meaning seeps into the being. May Xmas be a season of joy, love and laughter to you and yours. 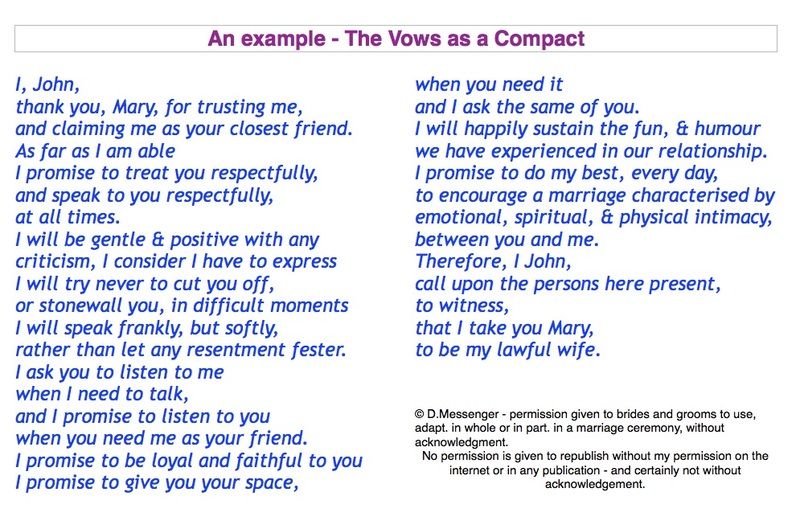 Thank You Dally, I lilked your ‘vows as a compact’ I encourage my couples to seriously think about their vows and say only what they mean – not just pretty words. It helps to reflect on how they want to act within their marriage to keep channels of communication open. I ask if I may refer this page to my couples?